HABIT: Large, showy, bowl-shaped flowers in mid spring, single and double blooms in white, pink, rose, salmon, and red. CULTURE: Need morning sun, afternoon shade. Like deep, rich organic soil and areas with cold winters best. Plant the roots 2” deep in fall. Cut foliage to the ground in fall and cover with mulch. Do not overfertilize. USES: Cut flowers, perennial beds, borders. PROBLEMS: Peonies like cooler weather than most of Texas has to offer. Leaf diseases can be a problem. Peonies have to be considered high maintenance plants. 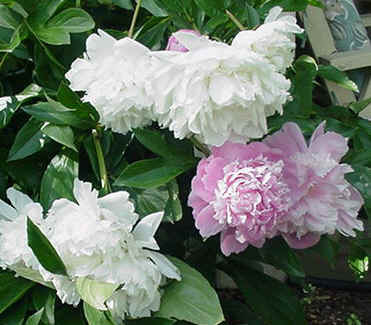 Tree peonies are easier to grow. Ants crawling on buds are feeding on a sweet exudate and helping the flowers to grow. Once the buds have opened the ants will disappear -- also normal. Some people think ants are REQUIRED to open the flowers, but this does not appear to be true. It seems a debatable question wheter ants are beneficial or harmful. Should you spray a pesticide to get rid of the ants? That is a definite no. Just enjoy the unique interaction of ants and peonies.